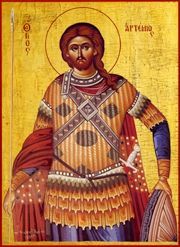 As we ponder parody, we might recall (in keeping with the theme of the issue illustrated above) that today is the Feast Day of St. Artemius Megalomartyr (AKA, Artemios of Antioch, Artemois the Greatmartyr, and Shallita). 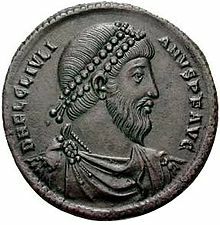 Artemius was one of Emperor Constantine the Great’s generals. 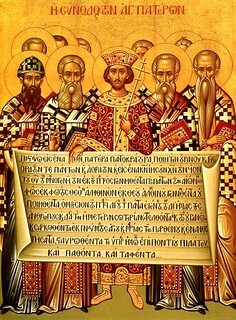 During the reign of Julian the Apostate he became a fanatical Arian heretic, hunting and persecuting monks, nuns and bishops, including St. Athanasius… But Artmius had a revelatory experience, converted to orthodox Christianity– and turned on the pagans who’d previously been his allies. Captured and accused by “heathens” of destroying idols, he met a tortured end– which may well have involved boiling oil– in 363.